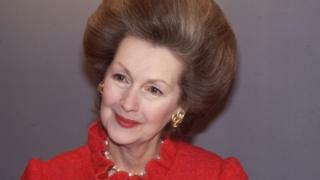 Raine Spencer, stepmother of Diana, Princess of Wales, has died at 87 after a short illness, her family has announced. Countess Spencer died on Friday morning at her London home, her son William Legge, the Earl of Dartmouth and a UKIP MEP, confirmed. Her marriage to Diana's father Earl Spencer from 1976 to 1992 was the second of three in her life. She was the daughter of romance novelist Dame Barbara Cartland. In her early life, she served as a Westminster city councillor from 1954 to 1965. Her first marriage was to the Earl of Dartmouth and lasted from 1948 to 1976. Following the death of Earl Spencer, her second husband, she married Count Jean-Francois de Chambrun in 1993, but the marriage only lasted three years. Image caption Countess Spencer married Earl Spencer, father of Princess Diana, in 1976. The couple are pictured in 1981. When she married Earl Spencer and moved into the ancestral home at Althorp, Northamptonshire, she became stepmother to 15-year-old Diana and 12-year-old Charles, who now holds his father's title. Ingrid Seward, friend of the countess and editor-in-chief of Majesty magazine, told the BBC: "When she first married Spencer, they [his children] loathed her. And they made her life extremely difficult. "They used to call her 'acid Raine'. Now I don't know which of the children invented that one but Raine was very stoic and she put up with it all. "And when Earl Spencer became ill she virtually did save his life. She was at his bedside the entire time and I think Diana suddenly saw that this stepmother wasn't as bad as she had imagined. "And then later in Diana's life almost at the end of her life, suddenly Raine Spencer was Diana's best friend." She said Countess Spencer was a "very intelligent, witty woman". "She had that wonderful energy, she could get anything done, which is why I think Spencer fell in love with her," she said. Ms Seward said that after the death of Earl Spencer, Countess Spencer went to work in department store Harrods. "She ran the shop floor, she worked everywhere and then she ended up in men's ties," she said. "But then she worked for the international side of Harrods. She spoke fluent French, she was very bright, she was charming, so she was the perfect ambassador for Harrods." For many years, Countess Spencer was also on the board of directors at Harrods. But at the 2007 inquest into Diana's death she said: "I never went shopping in Harrods. It was my husband who practically lived there." In that appearance at the inquest she talked about her relationship she had enjoyed with Diana in the years before her death in 1997. "She always said I had no hidden agenda," she said in her evidence. "So many people, because she was so popular and so world famous, wanted something out of her. It was a very draining life." Speaking at the inquest about press intrusion into Diana's life, she said: "I suppose this happens with pop stars and celebrities and people who call themselves celebrities nowadays." Countess Spencer and Diana were pictured talking in June 1997, just 13 weeks before the death of the Princess of Wales, when the countess was invited to a private viewing of Diana's dresses that were being auctioned by Christie's.